Hope you had a great 4th of July! I don't know about you, but my summer has flown by! In only a few weeks my kiddos will be back in school and we will be working on getting back into that school routine. I've been taking quite a few photos with my phone this summer and I'm always on the lookout for a way to display those smaller pictures. Using a few dies, Great Impressions Stamps and some leftover chipboard I made a few clipboard type frames. This one uses the Spring Floral Border (H228) and Heaven Sent (B221) to showcase those adorable memories! What have you colored lately? Don't forget to enter your "Stay in the Lines" coloring project in our monthly challenge! And if you love Great Impressions Stamps, we're looking for one more Design Team member; check out the Design Team Call! 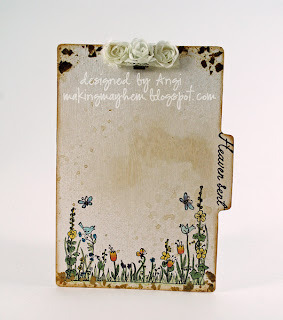 Stop by tomorrow for more Great Impressions Stamps inspiration! I love the vintage feel of this too! The tab on the side with your sentiment adds a unique touch! I love watching you grow as a designer Angi! What a cool and unique way to display your family photos! 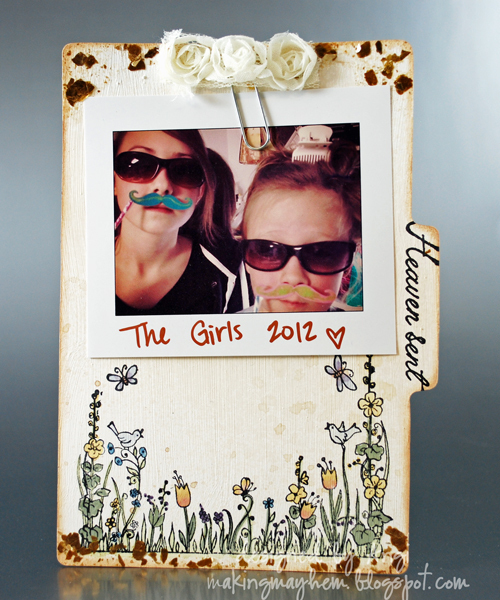 great frame, and love that picture hehehehe! oh very fun and creative!! !